Is Fethullah Gulen the feeble, kindly imam that mainstream media is making him out to be? Hardly. What this article will show is that Gulen is instead a career ultra-nationalist bent on carving up the Middle East and Asia. Gulen is on a mission to destroy Russia and China by cutting out territory that contains Turkic peoples from both nations. Important to understand is Gulen is at work creating a Turkic Islamic World Order inside the countries his schools, people, and businesses reside in. This is a step down from being God. With a whisper, a prophet releases the Word of God to creative or destructive purpose. To his people, this is Fethullah Gulen. Ankara has accused Gulen of setting up a counter government. I’ll show the proofs that within the United States, Gulen has in fact set up a political organization that is only a step down from a full blown government in exile. It is complete with diplomatic ties to other like minded countries. The US Government has denied involvement in the coup attempt. In fact it offered Erdogan moral support. This information leads to the conclusion that there was no direct involvement. Instead, rogue and/or ignorant elements of government have been working with Fethullah Gulen facilitating this coup attempt. Why would thousands of hyphenated-Americans support Fethullah Gulen against the interests of their own country? Is this legal? The Turkish coup is the hammer that makes this article series on the dangers presented by dual loyal citizens drive home. When hyphenated-American emigres can control elections, foreign policy, and drive domestic policy against the interests of the rest of the country including starting wars; maybe its time to rethink how our political landscape actually works. Lastly, it wouldn’t be any fun without tying this ultra-nationalist to Stepan Bandera’s OUNb. This tie by itself negates any indication of moderation inside his movement. In fact, he directly supports groups that have murdered thousands of people in the name of nationalism. Turkey itself is a Promethean country. In the last few segments of this article, Prometheanism is described as nationalist political governments set up as an insulator against the Soviet Union, followed by the Russian Federation and China. It’s overflow back into the Russian Federation (at the time Soviet Union) and China was to cause both countries destruction through the spread of nationalism. 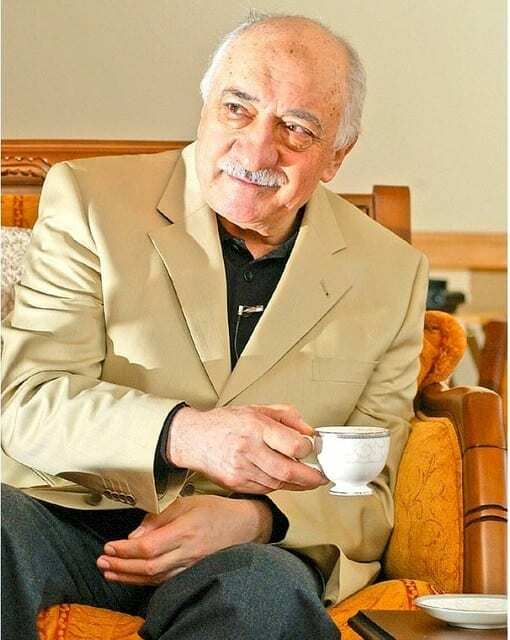 Gulen is the leader of what is known as Pan Turkism. The goal is to unite all the Turkic people in Asia. While sounding lofty, the goal is to unite them under a Turkish ultra-nationalist auspice. This includes uniting Turkish people in the Russian Federation, China, Iran, and Afghanistan. For Gulen, this would bring prestige, honor, and a formidable army under his group’s control. “…the US government has been trying to use the same Islamist policy that Adolf Hitler pursued. If a unified state can be developed it can be used as a proxy to attack Russia and China. If jihadis and the proper political structure can be married in an Islamic state, it can also be controlled through emigre populations and direct support. How many soldiers will this force multiplier add? Understood this way, the US military bases that are starting to form a ring around Russia are as meaningless as the troops stationed between the Koreas. The only value is the canary in the coal mine or early warning. They have little attack value against modern militaries sitting on their own borders. The bases serve as a deterrent to Russian influence inside those countries until the country itself is brought under the Promethean auspice of ultra-nationalism. Once the country has a nationalist government set up, it’s under the dual loyalty system described above. Instead of 50 military targets with a limited amount of personnel, it would be 50 countries with all their resources. In peacetime, the Prometheans pour their ideologies over the border to create new color revolutions and insurgency. That’s why Pan-Turkism is important to Gulen. As you’ll see from the following Erdogan helped build this monstrosity in Turkey by taking off the separation of religion and government safeguards that were in place. This will also show why Erdogan is arresting so many people across the Turkish power structure. When asked about the current coup, Gulen denies involvement and goes so far as to say that involvement would be an act of treason. Is this credible? Turkic-Americans today make up a tiny voting bloc with a population of only 350,000. Gulen’s presence has made up for this by creating thousands of Turkic-American culture groups and Turkic-American diaspora umbrella groups have a combined group portfolio worth around $35 billion. Gulen has a net worth reported to around $3 billion. In just Texas, there are over 1200 business support him and his work. One of his groups, the Turkic-American Alliance claims to be the umbrella that represents all Turkic emigre concerns to US government. This umbrella is associated with other Gulen groups that make close to the same claim and others that represent Turkish emigres regionally. The obvious danger to this diplomatically is that the US has strong relations with the country Gulen’s group is seeking to overthrow. Gulen has made numerous and major inroads through lobbying, campaign support, and Congressional junkets to Turkey. For the House and the Senate, Turkey is now only behind Israel as the #1 tourist stop for Congress. “He then started a confusing net of subsidiary groups by secretly funding more than 200 trips to Turkey for members of the United States Congress which went as far back as 2008. Has it paid off? 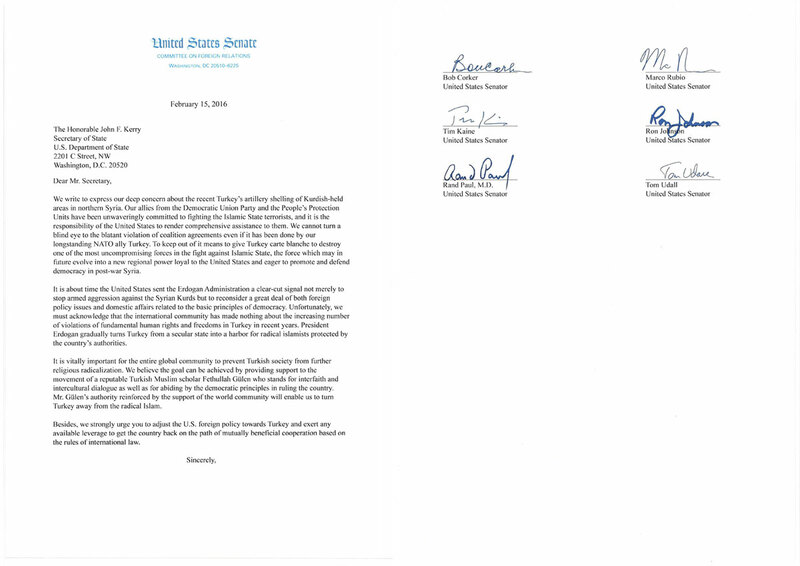 The following link opens to a letter from 6 US Senators to John Kerry. Gulen’s people lobbied the Senators on the Foreign Relations Committee to chastise Erdogan and called him an Islamist compared to Gulen’s apparent moderation. They go further by saying the State Department needs to get behind Gulen’s efforts and that he had the support of the world community. THIS is very close to the language that would be used speaking about a government in exile. When you look through their website they say they work with the other emigre groups in the US. They celebrate holidays with embassies of other countries in a way that adds to their clout in the US. The Turkic-American Alliance has Congressional dinners. When you consider that this group has been banned for their anti-democratic activities in many countries they sought to operate in, admittedly use subterfuge to make inroads to power-structures, and have been an enemy of state in their own country for a while now for ultra-nationalist Islamic activity!!??? Another Gulen group claiming representative authority over Turkic-Americans is the Turkish American Council. This group is so heavily invested in Congressional elections that it has developed its own caucus. Every one of these members are supported by and supporting an enemy of US NATO ally Turkey. Gulen has been following the same method of operations in the US as he has done elsewhere. Because he can’t teach radical Islamic nationalism, he instead focuses on creating relationships with up and coming “elites” that will favor his movement. Why would Turkic-Americans follow him? For many, they didn’t know. For some, they are sold on his nationalism. It’s easy to be a long distance nationalist and a lot easier to be a rabid one. The one thing that is clear is that the latter resent democracy and never have an issue sending US troops into harms way or putting unwary Americans in harms way. Gulen and his organization continually claim to be peaceful. In fact, it’s how they get around in western countries. But are they? Gulen has strong ties to the Turkish Grey Wolves. This Pan-Turkic ultra-nationalist group is responsible for the murder of thousands inside Turkey. They fought in Chechnya, the Balkans, and Afghanistan. The founder of the Grey Wolves, Alparslan Turkes wanted to take Turkey into WWII on the side of Nazi Germany. Who would a man like Alparslan Turkes look up to? This is a letter from Turkes to Gulen. Lord Grace,Zadar-i to scholars, our nation and ensures that you have reached a very useful service life.knowledge that you have raised, your suggestion has initiated a broad educational campaign which need wisdom and virtue of our nation with expert staff and you have to ensure the continued success. Society of spiritual awakening, which is a fundamental requirement for development in all areas and you have pioneered the rise. Peace, tolerance and brotherhood based on a return to self, but you have the space age began to rise. From Canada to Yakutia, schools and universities opened up everywhere from Mongolia to the United States of our national culture and national shows that our moral values tend to all of humanity. You virtuous life, your character showing no material benefit to you against greed has aroused great confidence in our people. Your efforts targeting the sake of Allah alone is re-conquering the old world we have lost our nature since several centuries. To clean the shaded asked to name your worship speaks pretext of Susurluk affair was so sad. But as you know, our nation, and the world knows you. It is not possible to do something malicious. Thank you very much for your gentle thank you letter. It is our duty to tell the truth. The mentioned statement, the right is merely to explain a small extent in public. Right from the Almighty to grant you good health and long life and so I entreat you have started the completion of developments. Ordinary hey, I offer love and respect. Currently, Gulen is still working with the ultra-nationalist OUNb through its UCCA groups and on think tanks. Is this the sweet peaceful imam you were told about? Who is it that Gulen’s very wealthy groups support in this 2016 presidential election? In the 1990’s Gulen befriended the Clintons. This seems to have paid off for both of them. “Last year The Daily Caller reported that numerous Gulen followers have donated to Clinton’s various political campaigns and to her family charity. One Gulen movement leader, Recep Ozkan, donated between $500,000 and $1 million to the Clinton Foundation. Are we comfortable with presidential candidates taking large sums of money from ultra-nationalists that support terrorism? Can we allow emigres to violate our laws and steal our elections? Part 5 (this article): Emigre Super Bloc Part V: The Failed Turkish Coup – An Exploded View. The information about Fethullah Gulen in Eliason’s article is of utmost importance and is more than timely; it is very late, as is his description of Gulen’s Pan Turkic movement’s inroads in the USA. Based on journalisticl experiences during the Cold War when I was in contact with Turkic peoples from then Soviet Central Asia, I can vouch for the close long-standing ties between Turkey and the Turkic peoples of Central Asia such as Uzbekistan and the other Stans, ties that are not imaginary or that must yet be forged. They exist. Their language is nearly the same, as is their religion and many aspects of their cultures. The estimated 300 million people of a Pan.Turkish state is not an exaggeration. Morever, the Fascistic nature of the the Fethullah Gulen movement is reflected in its support and financing of the Turkish extreme right-wing Grey Wolves terrorist organization headed by Alparsian Turkes which among countless assassinations also oranized the near fatal shooting of Pope John Paul II in Rome in 1981 by Mehmet Ali Agca of the Grey Wolves. As a journalist I also had occasion to meet A. Turkes’ deputy, Rusy Nazar, already then known as a professional killer with CIA relations. It is therefore natural to deduce which part of the US power structure favors the Gulen movement. Eliason’s fine article thus offers one explanation of Erdogan’s on-going purge in Turkey today. That the European Union would even desire or consider hot potatao Turkey as a member of the shaky union is a mystery. .